Oil analysis is perhaps one of the best tools in your arsenal when it comes to determining the health of a machine. The data in the oil not only holds the key to the health of the lubricant but also to that of any wear modes existing in the machines. When you pair this with historical data, you are able to trend these results and better understand what is going on inside the equipment. 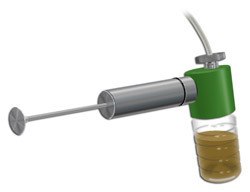 Many people regard drawing oil samples as an “as time allows” activity and fail to reap the benefits this technology has to offer. It should be taken seriously and be performed with the utmost care and diligence. It is not enough to simply fill a bottle with oil from the system; you must perform this task properly to accurately trend the data you receive back from the lab. The first step to accurately track data from your oil samples is to identify the proper location for an oil sample. Samples should be taken from turbulent or “live” zones within the oil system. Pulling a sample from the drain valve is not an accurate representation of the condition of the machine. Wear particles, contaminants and water settle to the bottom of the sump, thus making this sample full of historical data and difficult to trend as you continue to sample from this location. Drop-tube sampling is another method that should be avoided. This involves a vacuum sample pump, a length of tubing and the reservoir of the machine you are testing. With this method, it is challenging to get the tubing into a live zone of the oil and to repeat the exact same test location time after time. This also leads to poor trending of data and skews the accuracy of your sample. Modifying your equipment to include sample ports is a must if you wish to accurately trend your oil analysis data. Installing a sample port or sample valve provides a location where you can consistently pull a representative sample of the oil in your systems. The sample valve should be located in a turbulent area of oil flow. This can be found after pumps or in elbows where the oil turns and begins to flow violently. You want to sample upstream of any filters to ensure that you aren’t losing any of the valuable data due to filtration. Some systems may have only one sample port. For instance, if you have a gearbox, you should install a sample port with a stainless-steel tube extension so that the end of the tube (where the sample will be drawn from) is close to the gear teeth and at least 2 inches away from any of the walls of the gearcase. When you sample, you then will use the same port and draw oil from the same place every time. This leads to consistent and trendable data. It also makes spotting any abnormalities in the oil very easy. Many systems should have several sample ports. This is where the discussion of primary and secondary sample ports begins. A primary port is a location in the system downstream of the working components where you can get a good representation of the system as a whole with one sample. As you draw samples from this location and trend the results, there may come a time when you begin to see an increase in wear debris. This is where secondary sampling ports come into play. Secondary ports allow you to track where the increased wear is coming from in the system. Generally, secondary ports should be installed after individual components to allow for monitoring of their health. For example, if you are sampling the return line of a hydraulic system and see an increase in wear debris, you would want to track where that debris is coming from within the system. In a typical hydraulic system, you would need to have a secondary port after the pump and after any cylinders or hydraulic motors in the system. This would allow you to find where the increase in wear is originating. Using proper sampling techniques is just as important as the sample valves. You must flush your sampling hardware to limit the data disturbance by environmental contamination. Typically, flushing 10 times the dead space of the sample equipment will suffice and ensure that you are getting a good sample. For very dirty environments, keeping the sample bottle in a sealed bag while you draw a sample will help minimize data disturbance by outside sources. Oil analysis data has a wealth of benefits for those who utilize it properly. By ensuring that you are sampling properly, this data is more easily trendable and the results can be more easily understood. Of course, tracking historical results is a must for any good oil analysis program. Keep striving for world-class standards and always keep an eye out for what your oil is trying to tell you.